Ask a Cameron Park local where they go for brake service and they will tell you Automotive Services Unlimited, where you can expect quality brake service and brake repair on your personal and work vehicles. Brakes are the number one safety feature of any vehicle, and if your brakes are not responding properly when applied or making odd squeaks and squeals, it’s time for brake service and brake repair. We treat you like family and when it comes to brake service and brake repair, we will do all that we can to help you and your family remain safe. Regardless of what your automobile is fitted with, Automotive Services Unlimited. suggests that you properly maintain your brake pads and help us by checking them from time to time for wear and damage in between brake service Cameron Park, CA. Overtime, the heat and friction wears out your metallic brake pads. As this wears out, some brakes come with a metal indicator that produces that notorious “squealing” noise when braking. Over time, if this is ignored and you continue to drive on brakes that are dangerously thin, you will experience a grinding noise. This tells you that the pad has worn down to the rotor and you are now doing serious damage to the rotor–a far more costly replacement than a pair of new brake pads. Also of import, are your fluids–namely brake fluid. Purchasing brake fluid is cheap and the cap easy to find under the hood of your car. With a fresh dose of brake fluid, your brakes are guaranteed to run more efficiently and extend the life of your vehicle in El Dorado Hills, Placerville and Cameron Park. Your brake pedal shifts levels after you’ve had your foot on it for a while. Your brakes are making any kind of noise. Your brakes feel soft and sloppy. Your vehicle wants to creep forward into a crosswalk. 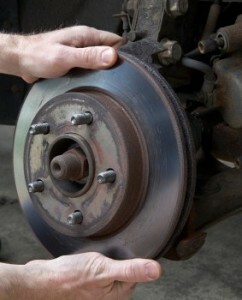 If it’s been awhile since you’ve had your brakes checked, repaired, or serviced. Proudly serving the Cameron Park community for over 25 years, are located at 3065-B Alhambra Drive, Cameron Park, CA 95682. Schedule service online or by calling (530) 677-3306.